I was walking along the Mall road looking for a small guesthouse where I had stayed once. It was the Mall Guest House, a simple yet cozy place with marvelous view rooms and a lovely small cafe. I knew it was close to the bend of the Mall road and near the Governor's house. As I stood in front of a large white building with a board saying 'Hotel Dolphin' wondering where the guest house might be, a gentleman walked up with curious eyes and asked me "Are you looking for something sir?" I came to know later that he was the manager of the hotel I was standing next to. When I told him what I was looking for, he smiled and said, the Mall Guest House is no longer there. It has been taken over by the Dolphin group of Kolkata and the new Dolphin hotel has come up in its place. It was obvious to me that the earlier guesthouse was demolished to make a new building, The Dolphin Hotel that offers 2 star amenities. While I was sad to miss the music, the snacks and the lovely rooms of the Mall Guesthouse that was run by a local family, I was curious at the same time to figure out what the new hotel now offers. The hotel is owned by the same Dolphin Group that runs Dolphin hotels in places like Digha and Bakkhali in West Bengal. As you walk in, there is a narrow carpeted passage. On one side of the passage is a small reception counter. When I walked in, I found the front desk manager chatting with another man outside leaving the front desk unattended. He however quickly followed me. There are 11 rooms in this hotel of different categories. Most of the rooms are below the reception level. There are Super Deluxe double rooms that offer mind blowing views of the valley and the entire snow peaks including the Kanchenjunga. As you open the windows from one of these rooms, you feel as if you are standing on a view point tailor made to watch the Kanchenjunga peaks. There are also Deluxe double bedded, deluxe four bedded and standard four bedded rooms. The Deluxe four bedded is the costliest category followed by Super Deluxe Double, both of which have superb views. Some of the rooms are partially and rest are fully wood paneled including the ceiling and provide gorgeous and warm look. There is a separate sofa seating area in the rooms that are placed by the window side. The rooms have standard amenities like TV with satellite channels, phone, floor carpet, room heater (on request) etc. Even if you do not have a view room, there is a view point right outside the hotel and on the Mall road. 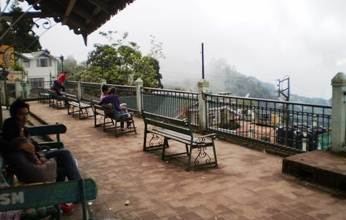 You can relax on a bench here and watch the panoramic view of the valley and the mountain range for hours. 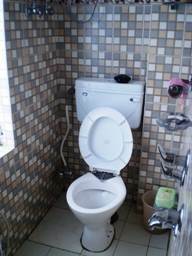 Bathrooms are of western style and modern. They have geysers for hot water which works when the main power supply is available. There is a restaurant upstairs. There are few glass-top dining tables lined up against the windows that face the Mall road. The space in the restaurant is limited. They serve breakfast, lunch and dinner. The menu includes Indian and Chinese. Other amenities offered by the hotel includes laundry, room service, sightseeing tours etc. 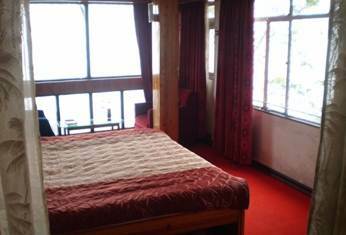 It has a great location at the corner of the Mall road with some of the rooms offering unabated views of Kanchenjunga (of course on a clear day. Otherwise you will see only a white blanket of fog all around). So if your priority is to get views directly from the room, then some of the rooms in this hotel can truly provide unmatched treat to the eyes. Book a Super Deluxe room or ask specifically for a view room. However, other than rooms, the hotel has hardly any other space. Even the reception area is on a narrow dark passage. The dining room too is on a narrow space. Being at the far end of the Mall road, it would take some 6-7 minutes walk to reach the Mall and the nearest shopping areas & restaurants. The in-house restaurant here is small and quite stuffy although it has windows on one side. I don't expect to get great food either. So if you want to eat out, then you will need to walk up to the Mall or Nehru Road. There are no shops or eateries close to the hotel. Walking back at night along the Mall road can be scary as there is usually no soul around on the lonely tree shaded road. The entire area gets quite desolate after dark. This area falls within the pedestrian zone and free of vehicles. Taxi can drop you at Gorkha Bhawan which is about 2-3 minutes walk. The nearest taxi stand is below Nehru road (Clubside stand) which is about 10 minutes walk. You can expect only an average service. From the Chowrasta Mall, if you take the Mall road on the right, the hotel is located at the far end of the road where it turns around the Observatory Hill and right next to the last view point on the road. The state Governor's House is also close by. 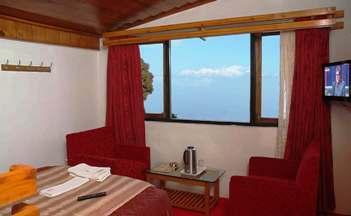 1) Check out Darjeeling Top 2 Star Hotels to know about the great mid priced hotels. I am a widely travelled Architect from Kolkata who had fallen in love with Darjeeling since school days. Even my thesis topic was Hill Resorts of Darjeeling where I did extensive study of Sterling Resort of Ghoom designed by Architect Pravin Mukhia. I have been in Darjeeling for 6 to 7 times but never in last 12 years. I plan to visit Darjeeling next May 2015, to make a memorable stay for 10 days in Hotel Dolphin with my wife and children. Thanks to your website that I decided on Hotel Dolphin (though I am yet to book the hotel on specific dates officially). I hope its a good choice for value of Rs.3000 a day for a 4 bedded room. Please opine. It's location is one of the best .... quiet, on the mall road and great views of the snow peaks on clear days. Rooms are nice as well. But unfortunately, the service is often poor and unprofessional, and the nearest restaurants or shops would be about 6-7 minutes walk. After dark, this stretch of the Mall road becomes very lonely and unsuitable for walks. Taxis won't come up to the hotel. They will drop you at Gorkha Bhawan from where the hotel is about 2-3 minutes walk. So keep all these in perspective when you book. 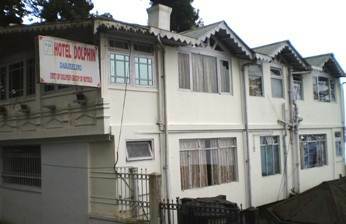 I went to Darjeeling in the 2nd week of February 2012 and stayed at Dolphin Hotel Darjeeling. At 8.30 p.m when I entered the kitchen I found starting from Manager to Room Boy every one was engaged with alcoholic drink. When I told them that before serving the guests why you people are busy with this type of thing, surprisingly in the same night when I came back to hotel I found my one bag, full with dresses/money and my cell phone were stolen. But again to my surprise I found that on the same table my costly watch, in the hanger costly blazer was not stolen. In the morning when I reported the same to the manager he simply said that it was my fault. I should have reported to the police about the same, but the manager of the hotel threatened me and said if you complain then it will be difficult for you to go out of Darjeeling as you don't have any money with you. Instead he gave me Rs. 500/- to return to Kolkata. After reaching Kolkata I have returned Rs. 500/- to him by depositing the amount at SBI, Birati Branch. What I have lost is lost but I would request others if you stay in Dolphin Hotel Darjeeling, don't go into argument with staff.